This book is written as a practical healing journey, not just as a academia book on healing. Guiding the reader through the Word of God in a logical progression of steps, making one aware of the power behind the Word, for Jesus came to give us life and life more abundantly, John 10:10. God’s Word is able to meet all of our needs if we but let His Word work in our lives. The Word can heal us both emotional, physically and bring us into a closer and a deeper relationship with Him. The book addresses many relevant topics in every day language concerning God’s Word. There are many short and concise chapter topics, that makes for easy reading. The focus of this writing is the revealed truth within God's Word that was given to me, for His Word is unchanging and can bring life and life more abundantly. Whereby, our emotions and the situations that we go through are ever‑changing and writing about them will produce no eternal value. 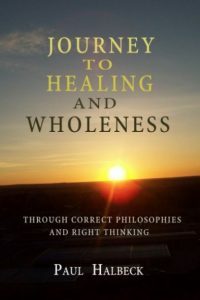 This is written as a “healing journey," not just as a book on healing. I think you will find it to be much broader in its scope than that. For I am writing this not just from academic knowledge, but as I write it, I am also going through this same journey to receive my healing. Some of the sections in this book you may not think are very relevant to the subject of healing, but they all apply. For the issues that we carry with us, whether physical or emotional, affect us as a whole person and should not be dissected into smaller components. As you go through these teachings, know that healing is a journey. By this, I do not mean a journey of slow physical improvement over a number of weeks, months or years. People use this as a justification, rather than to believe and receive healing solely from God's Word. However, even when physical healing comes instantaneously and overnight, it still took a process of time for us to renew our mind and get to the place where we could receive our healing. God has provided several ways within His Word to pursue healing. If one way doesn’t seem to work for you pursue another way, but do not give up! I assure you that if you draw a line in the sand as to how far you will go to get your healing, our adversary will make sure that you cross that line. In many ways, it is your choice. Are you going to remain steadfast until the end, resting in the truth of God’s Word and become that overcomer or are you going to give up, choose to make the best of your physical sickness or limitation and settle for second best? The sections I have written are by no means exhaustive, there is much more to be said about each point. However, I have tried to address most mind‑sets that hinders us and most ways that allows us to receive healing from God. It is my wish that everyone reading this, no matter what their condition might be, regardless of how it came upon them or how long they have had the condition, will find their healing. That a seed will be planted and they will rise up and say, “It is time for my healing,” Knowing the truth that they are a child of God and that life and health are part of the gospel. If you cling to the truth, you cannot fail. For Jesus said, “And you shall know the truth, and the truth shall make you free," John 8:32. This journey will first show you the truth of God's Word and in the truth you will find your personal healing. Have you read this book? Tell us what you thought! All information was provided by the author and not edited by us. This is so you get to know the author better.